You can activate two-factor authentication in Yandex.Passport. You will need the Yandex.Key app, which you can install on a mobile device running on iOS or Android. You can't use devices that don't support this app (like Amazon Kindle Fire). All Yandex apps, programs, and services will ask for one-time passwords. You will also need one-time passwords to sign in using social networks or log in to your Mail for domain inbox. You do not have to enter your username and password if you log in to Yandex using a QR code. For third-party mobile apps, computer programs, and mail importers, you must use individual app passwords. Your Account access restoration process will change. Note. To move your account to a different smartphone or tablet, open the Access management page and click Change device. Setting up 2FA takes a few steps Two-factor authentication will only activate after you click Complete setup. If you already linked your phone number to your account, the browser will display this number and ask if you want to confirm it or change it. If your current phone number is not linked to your account, you must link it or else you will not be able to restore access to your account on your own. To link or confirm a number, request that a code be sent via SMS and then enter it into the form. Once you've entered the code correctly, click Confirm to proceed to the next step. Think of a four-digit PIN code and enter it for two-factor authentication. Attention. As with bank cards, you shouldn't share your PIN code with anyone and it cannot be changed. If you forget your PIN code, Yandex.Key cannot generate a correct one-time password, and access to your account can only be restored by contacting our Support Dept. Click Create to confirm your PIN code. 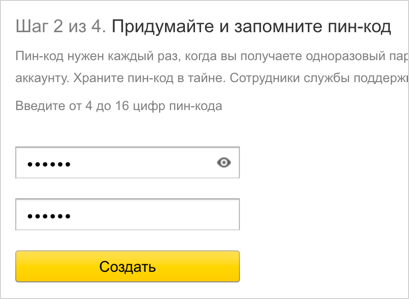 The Yandex.Key app is required to generate one-time passwords for you account. You can get a link to the app directly on your phone or you can install it from App Store or Google Play. Note. Yandex.Key may request access to your camera in order to recognize QR codes when accounts are added or when you sign in using a QR code. In Yandex.Key, tap the Add account button. 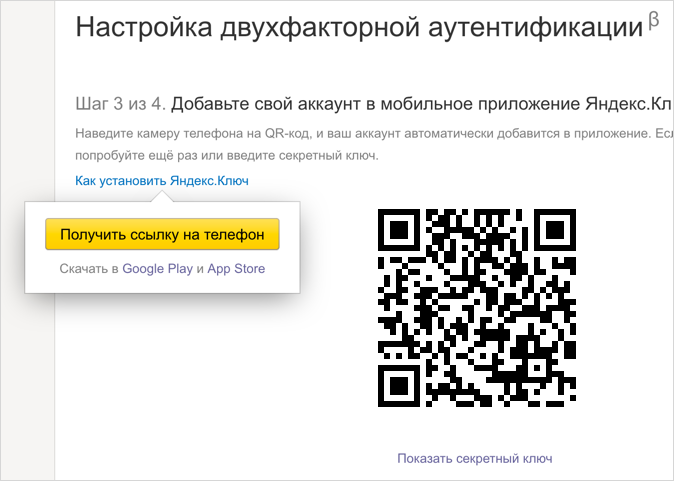 Yandex.Key will turn on your camera in order to scan the QR-code displayed in the browser. If the QR-code cannot be read, click Show secret key in the browser, or on Add it manually in the app. Instead of the QR-code, the browser will display a sequence of characters that must be entered into the app. When it recognizes your account, your device will request the PIN code you created during step two. To make sure you have set everything up correctly, enter your one-time password. Two-factor authentication will only work if you enter the correct password. Just enter the PIN code you created during Step 2 into Yandex.Key. The app will display your one-time password. Enter it next to Enable and then click the button. If you enter the correct password, 2FA will be enabled and your Yandex.Passport page will open.